The turnover being recorded with the products just a very short time after being launched onto the market showed how right the decision was. With Fundo Plano, the flattest complete system for floor-level showers, as well as with Fundo Riolito, the shower element with linear drainage, wedi showed that it has its finger directly on the pulse of the time. Just how directly was demonstrated by the many enquiries received about the availability of additional variations. wedi reacted to this immediately and now offers even more installation flexibility as well as an extra-long format. Floor-level showers are among the most important wishes that a customer has when renovating and modernising their bathroom. In many cases however – particularly in the case of existing buildings – the available installation height renders the realisation of these customer wishes impossible. With wedi Fundo Plano, however, a floor-level shower can be reliably installed with a total installation height of just 65 millimetres. In order to ensure that installation can be completed both quickly and easily, wedi not only has many dimensions in its range, but also a new drain. Fundo Plano in the dimensions 1200 x 900 millimetres is now available ex-works with the drain located on the shorter side. The new connection will provide for even greater flexibility when it comes to installation and will help to avoid that valuable installation space is wasted. wedi Fundo Riolito serves the market segment linear drainage which is currently enjoying trend status. 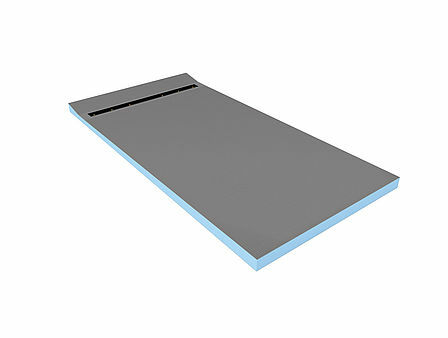 Purely from an optical point of view, this drain variation has a very big advantage in that the entire surface area of the shower can be tiled without having to cut any of the tiles. As with all Fundo elements, wedi offers Riolito with integrated slope ex-works and a securely sealed drain. This gives the installer and the client that sense of security that the type of water damage that can occur due to installation errors cannot occur here. The new variation from wedi Fundo Riolito in the extra long format of 1800 x 900 millimetres is aimed at providing safe installation solutions when renovating bathrooms. During the course of such bathroom renovations, the wish is often expressed that the bathtub be replaced with a modern and spacious floor-level shower. Fundo Riolito, which has been adapted to the size of a standard bathtub, together with the extensive range of Riolito accessories, allows these customer requirements to be realised quickly, precisely and in a watertight way. Further information is also available at www.wedi.de or on YouTube. 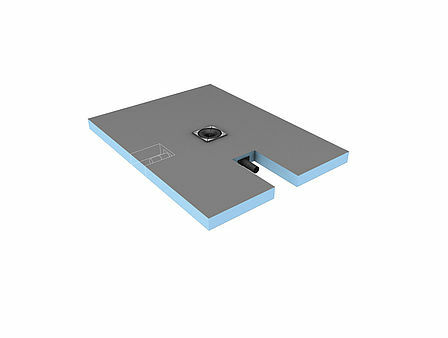 In order to provide its customers with even more flexibility when it comes to installation, wedi Fundo Plano is now available with another drain. The extremely limited total installation height of 65 millimetres remains unchanged. In order to provide its customers with even more flexibility when it comes to installation, wedi Fundo Plano is now available with another drain. The extremely limited total installation height of 65 millimetres remains unchanged. Out with the old bathtub and in with wedi Fundo Riolito: the floor-level shower element with linear drainage is now also available in the 1800 x 900 millimetre format which is exactly adapted to the size and dimensions of a standard bathtub. Out with the old bathtub and in with wedi Fundo Riolito: the floor-level shower element with linear drainage is now also available in the 1800 x 900 millimetre format which is exactly adapted to the size and dimensions of a standard bathtub.